This Quercy stone property has been carfully renovated with original features Lovely and peaceful in the countryside with a beautifull garden and swimming pool in a peaceful hamlet. This village house offers accommodation over three floors of 90m² each, to restore, and a vaulted cellar, 35m². Pretty stone village house which has been recently refurbished. Approx 96m² of living area. 2 bedrooms, a double garage with two more bedrooms with exposed beams. Very good condition. Pretty stone house of approx 105m² of living area, 3 bedrooms. Which has been carefully renovated with original materials. With outbuildings : a carport, a breadoven, a well. Set in approx 4300m² of land. In the countryside, peaceful location, lovely view. Lovely stone property with two houses. : A main house of 300m² with 6 bedrooms and its barn converted into a 210m² house with 3 bedrooms and possibly 4. A swimming pool, 4 garages. Set in approx 1 hectare of fenced garden with fruit trees and a well. In the countryside. Peaceful location. Pretty stone house with its restored barn adjoining, so uncommon. Carefully renovated with original materials and lots of taste. With a swimming pool, and about 1.7 ha of land and 2 wells. In a peaceful situation. Very good condition. This property with comfortable accommodation is perfect for family that needs extra space in summer season, and benefits from an enviable location in the peaceful Quercy Blanc Valley. Lovely Stone village house with caractere, light and spacious, 3 bedrooms, carefully renovated with original materials. Terrace with a view over the village and countryside beyond. A carpark and a garage. Ensemble de 2 maisons en pierre , l'une avec : pièce de vie, 3 chambres, 1 bureau l'autre avec : pièce de vie, 1 chambre, une mezzanine. Dépendance de 400m². Terrain attenant 1.35ha 18ha non attenants. Dans un hameau, agréable maison ancienne rénovée avec goût, bel espace de vie ouvrant au Sud sur un jardinet clos. Possibilité 3 chambres les combles, sous sol complet. Bonne prestation ! L'authentique et le confort. Belle maison en plein centre médiéval. Maison confortable proche des commerces, composée d'un séjour spacieux avec clim réversible et accès terrasse couverte, cuisine ouverte, 3 chambres, salle d'eau, wc. Agréable jardin d'environs 700 m² . Aucun de travaux à prévoir! A Voir Sans Tarder !! Agence immobilière Combarieu, présente sur le secteur Caussadais et ses alentours depuis plus de 40 ans!! Apart from the Atlantic and the Mediterranean, the wild beauty of Causse and the opulence of the Garonne plains, Tarn-et-Garonne is a department with very good road and rail networks. It benefits from a pleasant climate, well preserved countryside, and a wonderful cultural heritage. Country towns, churches and chateaux scatter the countryside. Its inhabitants are welcoming and meet up in the colorful markets where fruit, cheese and wine is abundant. Property in Tarn-et-Garonne remains fairly affordable and stable. 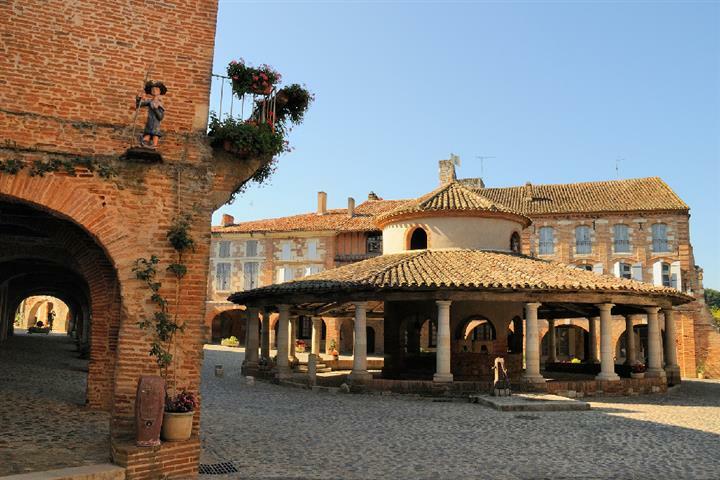 If you would like to live near a lively town, no doubt you will find an apartment or house for sale in Montauban. But if you are looking for the peace of the countryside, your property search could include Saint-Antonin-Noble-Val, at the heart of the Aveyron Gorges, or Auvillar, delightful village with its astonishing circular covered market.